Another Thursday means another night at West Coast Tavern. Tonight we've got The Red Fox Tails. I'll be there after 9 pm, and as always, the shows are free. Come have a drink or two with me. 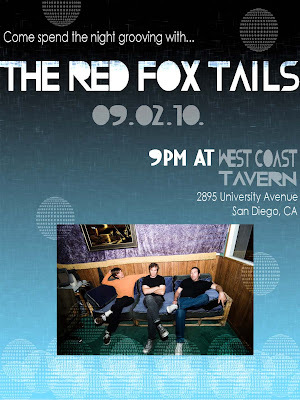 With roots steeped in the culture of New Orleans, Southern California Beach vibes, and Colombian necktie rhythms, the sound of the Red Fox Tails is as diverse as their backgrounds. By combining elements of Jazz, Surf, Rock, Latin, and Second Line rhythms, The Red Fox Tails have created a genre all their own--”Garage Lounge.” Whatever the name, after having a listen to their beats, feel free to let loose, shake your rump and feel good.